DeZURIK’s Urethane Knife Gate Valves are designed for on-off and throttling applications in the mining industry. They are designed for abrasive slurry and dry abrasive material handling applications. Temperature ratings are -40 to 180°F (-40 to 82°C). 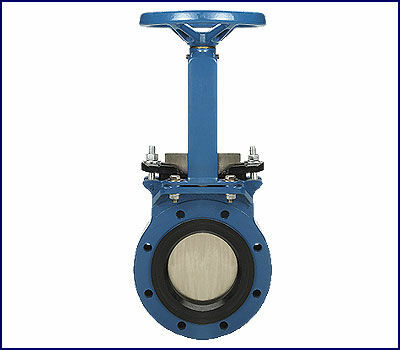 Urethane Knife Gate Valves are available in sizes 4-24” (100-600mm). They feature a one-piece cast-in-place liner that provides bi-directional, drip-tight shutoff to 150 psi (1030 kPa) on 4-12” (100-300mm) valves. All wetted surfaces of the body are lined with urethane. Gate material options include 304 and 316 stainless steel. The wafer face-to-face design saves pipeline space, is lightweight and is easy to install. The wafer design also means extra valve strength. Supporting ribs between flanges resist strains from piping misalignment. Flanges are drilled and tapped to the ANSI 125/150, DIN 10 (BS 4504/10), DIN 16 (BS 4504/16), JIS 10, AS2129 Table D and E. Valves can also be furnished with flange bolt holes drilled for through bolting, except in the chest area. The urethane liner is cast in place to form a continuous liner throughout the entire body, chest, packing chamber and flange face area. The robust urethane seat portion of the one-piece liner covers the interior of the valve. The urethane liner extends over the flange face to serve as the valve’s flange gasket. No additional gaskets are required. Reinforcing ribs provide a solid superstructure mount and give the body added strength. Placement of the ribs assures packing chamber support to resist both internal and external stresses. A durable gate resists damage and allows higher pressure drops. The gate is stainless steel for corrosion resistance and is finish ground on both sides and edges to insure long packing and seat life. The gate includes a knife-like bevel that pushes aside or cuts through thick slurries or solids in the flow. Square braided PTFE packing insure a tight seal with a minimum of packing gland pressure. Extra rings of packing and a smooth uniform chamber assure a tight seal. The DeZURIK Urethane Knife Gate Valve is offered with a choice of handwheel, chainwheel, bevel gear, cylinder or electric motor actuator. A wide variety of accessories are available including handwheel extensions and floorstands, plus various cylinder actuator accessories for customizing the valve/ actuator package to meet specific application requirements. The fabricated superstructure stands up under the most difficult operating conditions. An bronze yoke sleeve provides corrosion resistance and assures easy operation. An added grease fitting provides lubricant to the stem thread and yoke sleeve. All valves are furnished with a stainless steel stem as standard for extra corrosion resistance that provides easy operation and long life. The stem has single-lead threads to minimize wear and reduce operating torque requirements of the valve.